Voice control is an incredibly fast-growing market, far exceeding growth of other technologies historically. 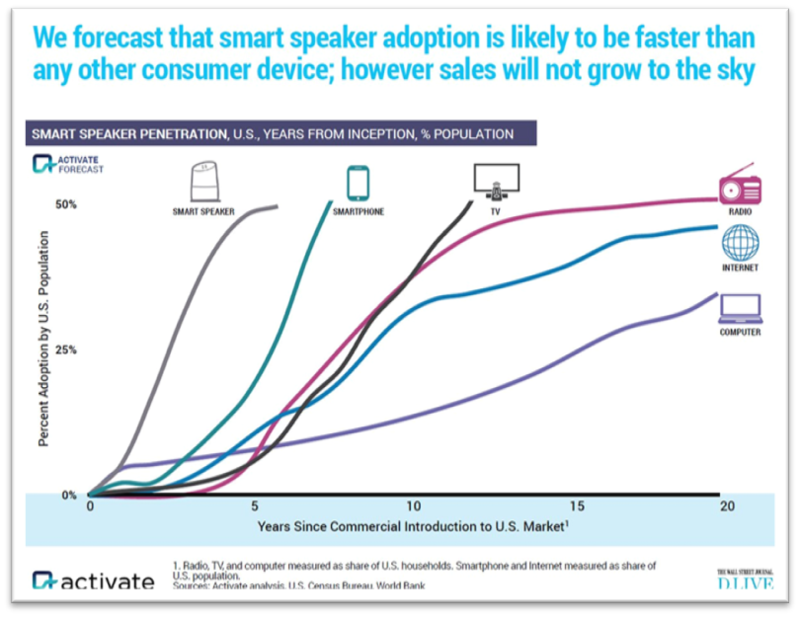 In the US alone, 66 million smart speakers have been installed in people’s homes. Worldwide, Amazon alone have sold over 100 million of their smart speakers. There is no doubt that this trend is set to continue as smart speaker prices fall, becoming rapidly one of the cheapest components in the Smart Home puzzle. Statistic from voicebot.ai: Google Home launched in Australia in late July 2017 and in Canada in late June. Amazon Echo arrived in Canada in November 2017, but not until February 2018 in Australia. Amazon Echo launched in the U.S. in limited release in late 2014 followed by Google Home in November 2016. U.S. consumers didn’t reach 7% ownership rates for three years whereas Australians are nearing that mark in about one quarter of the time. 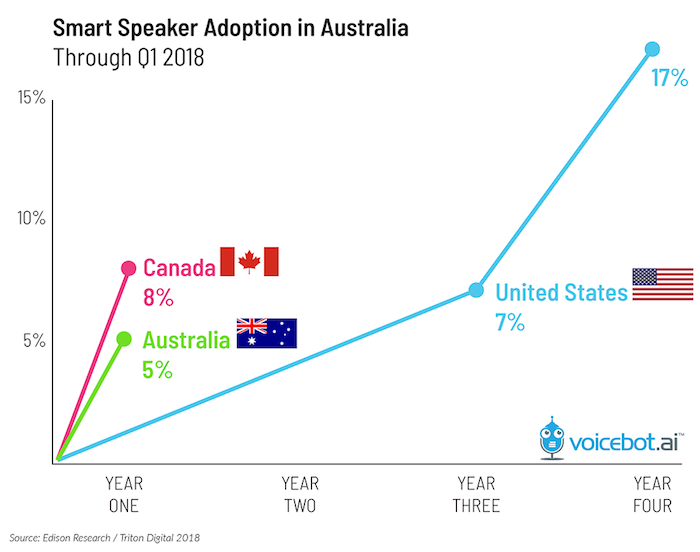 Smart speaker availability in the U.S. and the extensive media coverage no doubt has helped drive faster adoption in both Australia and Canada. An interesting finding of Edison’s Infinite Dial Australia 2018 is that Australian awareness of Google Home smart speakers actually exceeds that of Americans despite the longer time in market. Given a number of ads run both by Google, Telstra and other companies in Australia, awareness of Gogle Home amongst Australians is greater than that of Amazon Alexa. 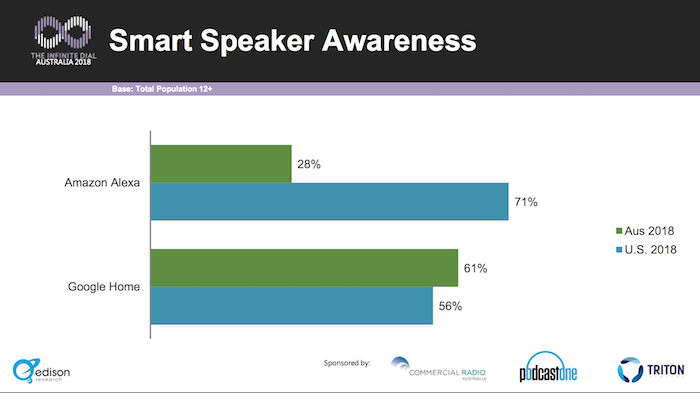 It is still quite amazing that in under one year Smart Speakers have recognition with over 60% of the Australian public. 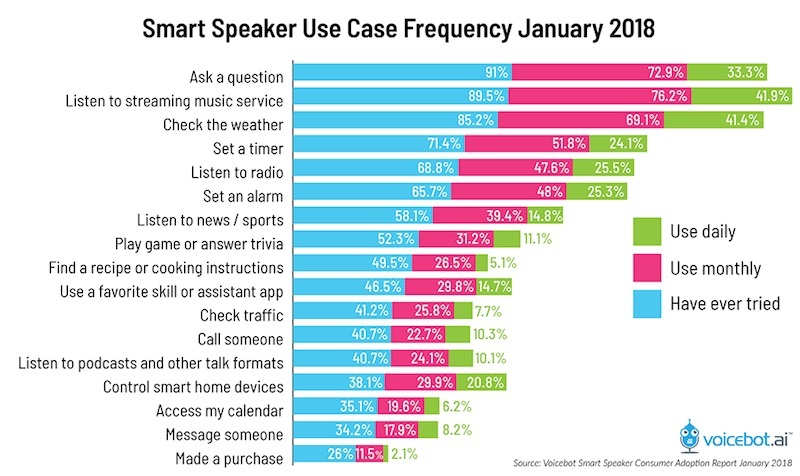 A study by comScore in 2017 found a significant proportion (>50%) of smart speaker owners use their voice controlled device for general questions, weather inquiries, and music streaming. They also found almost 40% of users use their voice control devices for controlling their smart home devices.